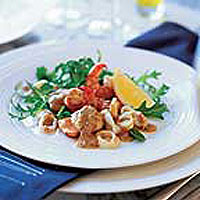 This is a classic summer Italian starter and, to save time at the last minute, you can prepare the seafood and dressing a few hours in advance. Chill in the fridge and then assemble when your guests arrive. Heat 2 tbsp of the oil in a large frying pan. Add the mixed seafood and stir-fry for 4-5 minutes, or until the fish is just cooked. Transfer into a large bowl, set aside and allow to cool for 20 minutes. Roughly chop the tomato and place in a food processor with the mint and garlic. Blend until smooth. Add the juice of 1⁄2 lemon and the remaining olive oil, season and blend again to make a smooth dressing. Toss together the cooled seafood and the dressing. Divide the rocket between 6 individual serving plates and spoon the seafood mixture over the top. Cut the remaining lemon into wedges and place one on each serving. Scatter with a few fresh mint leaves and serve. Look out for Anchor Frozen Luxury Fruits de Mer (400g). Simply defrost and add an extra 200g prawns or your favourite seafood.